Imo APC Governorship candidate was missing in the list, the Independent National Electoral Commission, INEC released today, November 11th. It was gathered that INEC released names of the 67 governorship candidates and their respective running mates at its office in Owerri, the state capital. While candidates’ names and that of their running mates were displayed alongside their credentials and personal information at INEC’s office, the Imo APC governorship candidate name couldn’t be found on the list. 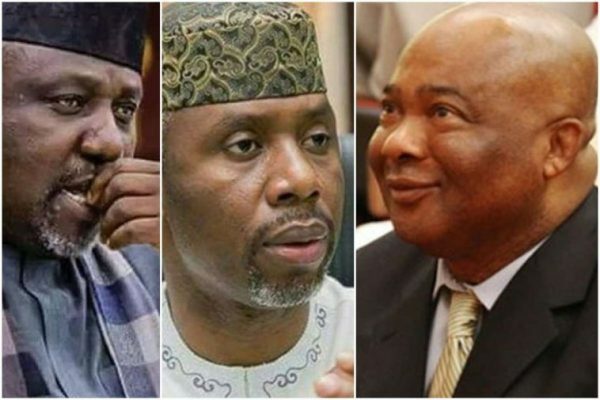 The former deputy speaker of the House of Representatives, Emeka Ihedioha of the People’s Democratic Party, Ike Ibe of the Independent Party and a former Senator, Ifeanyi Araraume of the All Progressives Grand Alliance made the list displayed at INEC’s office. Others are, Micheal Ikoku of the Young Democratic Party, Linus Okorie of the Young Progressives Party and Alloysius Osuji of Mass Action Joint Alliance. Three women emerged as governorship candidates. They are, Omeogu Chidiebere of the African Action Congress, Joy Udodiri of MMN and Adaku Ibe of the Democratic Peoples Party. An INEC official who spoke to Punch’s correspondent, disclosed that there were court orders stopping the Commission from publishing the name of the Imo APC governorship candidate. Recall that Uche Nwosu and Senator Hope Uzodinma have been in and out of court battles, on who should emerge the state’s gubernatorial candidate in the 2019 election. Recall that Nwosu was declared the winner of the October 6 APC governorship primary, while Uzodinma was pronounced winner of the October 1 primary which allegedly did not hold in the state. The post Imo APC Governorship Candidate Missing As INEC Publishes List appeared first on LATEST NIGERIAN NEWS BREAKING HEADLINES NEWSPAPERS.